Valchromat - an exciting alternative to MDF. Over the last 30 years MDF has never really been completely accepted by specialists as an adequate product for different finishes and decorative purposes, which called for a product combining colour and other specific features lacking in existing products. Valchromat was first introduced in 1998, as a response to that demand. Importantly Valchromat is at least 30% stronger and more stable/resistant than standard MDF board. It is completely moisture resistant, provided the correct finish is applied and increases the life span of tools used in its manufacturing due to a lubricant agent in its composition. 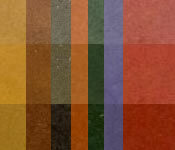 Choice of Colours and Finishes : There are 8 different colours and 7 different thicknesses. Valchromat accepts any kind of finishing. By applying a glossy lacquer one can have a modern trendy look, and by applying oil one can create a slightly more conventional look. A mat or waxed look, and fire retardant and texturised finishes are all achievable. UK Based Distributor : Avon Plywood is an importer, stockist and distributor for Valchromat based at Keynsham near Bristol. Please contact us if you would like to receive further information and samples.